5. All cord blood banks should be subject to the same standards, regulations and accreditation requirements. Download "5. All cord blood banks should be subject to the same standards, regulations and accreditation requirements." 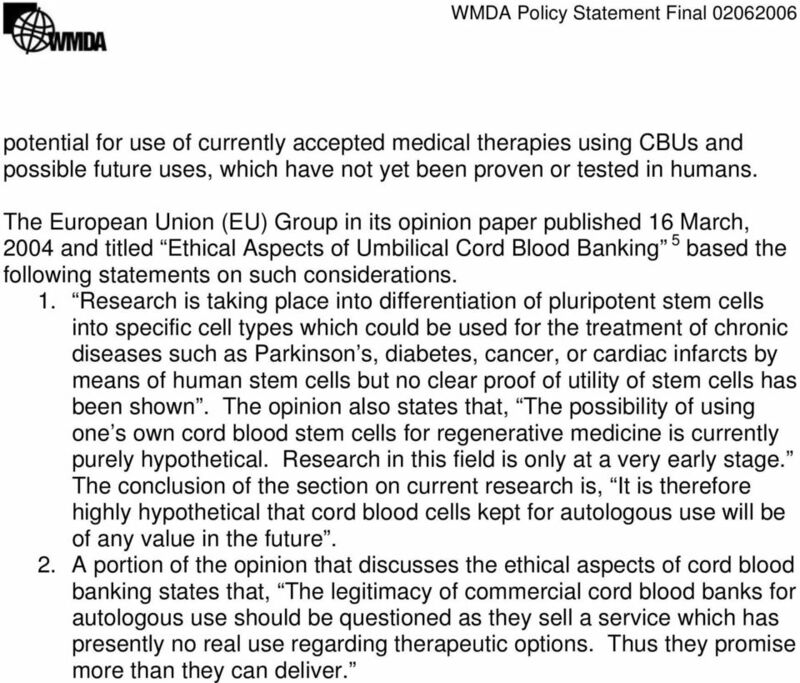 1 WMDA Policy Statement for the Utility of Autologous or Family Cord Blood Unit Storage (This policy statement has been approved and adopted by the WMDA board on the 25 th of May 2006) The Cord Blood Registries Subcommittee, a joint collaboration of the Ethics and Donor Registries Working Groups, of the WMDA has discussed the EU recommendations, policy statements of several professional organizations in the US, Europe and Asia and considered the public interest and the interests of its member organizations in public and autologous cord blood banking. It is recommending the following policy statement. 1. The World Marrow Donor Association supports the establishment of public cord blood banks that are based on altruistic and voluntary cord blood donation. These units should be available for any patient who needs an allogeneic transplant and for related research. A large, diverse inventory of cord blood units and an effective ability to exchange units internationally offers the most benefit for all populations and is the most cost effective strategy. Public cord blood banking should be supported by national governments. 2. 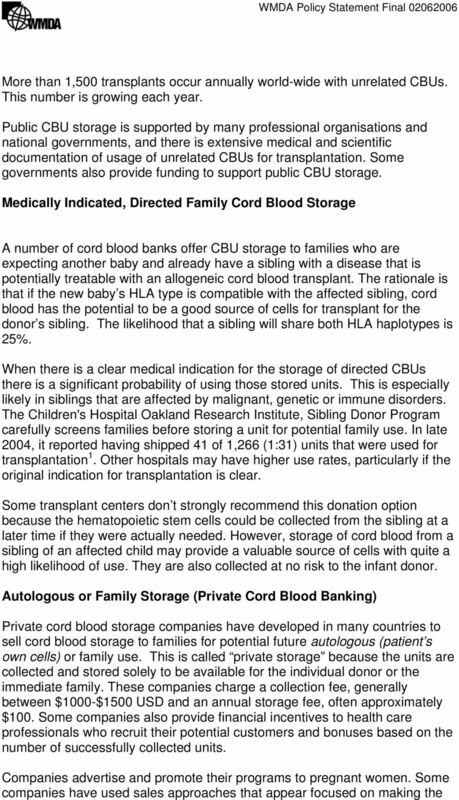 Collection and storage of cord blood units from family members of patients affected with, or at risk for, diseases that may be treatable by transplantation have a documented value. The storage of cord blood units where there is a clear medical indication should be supported. 3. Today the likelihood that an autologous cord blood unit will be used for transplantation is very low. There is currently no clear proof that these cells will be able to be used for regenerative medicine or to treat other diseases in the future. However, at the present time it is impossible to predict the results of research that may affect the future potential use of these cells. 4. Storing cord blood for autologous use is an option in many countries. Cord blood collection and storage is a medical procedure done at a critical time for the mother and baby. For this reason, in these countries, national governments must ensure that the family receive impartial and accurate information about the potential risks and benefits of private storage and sign an informed consent document. 5. All cord blood banks should be subject to the same standards, regulations and accreditation requirements. 6. Promotion or general funding of autologous or related cord blood storage in the absence of a medical indication for directed donation should not be supported by national governments. 2 WMDA Policy Statement for the Utility of Autologous or Family Cord Blood Unit Storage EXPLANATORY REPORT OF THE CORD BLOOD REGISTRIES SUBCOMMITTEE The World Marrow Donor Association (WMDA) mission statement is: WMDA is a voluntary organisation of representatives of blood stem cell donor registries, cord blood banks, other organisations and individuals, with an interest in hematopoietic stem cell transplantation. It provides a forum for mutual discussion of all issues regarding the clinical use of hematopoietic stem cells from unrelated donors across international boundaries. These discussions, which take place in working groups, make it possible to formulate guidelines on for example logistics, quality control, accreditation, ethics, finances, information technology and registry accreditation. 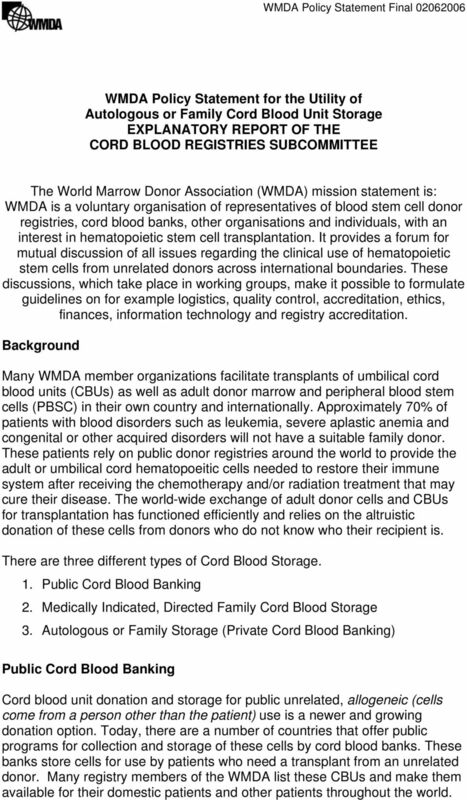 Background Many WMDA member organizations facilitate transplants of umbilical cord blood units (CBUs) as well as adult donor marrow and peripheral blood stem cells (PBSC) in their own country and internationally. Approximately 70% of patients with blood disorders such as leukemia, severe aplastic anemia and congenital or other acquired disorders will not have a suitable family donor. These patients rely on public donor registries around the world to provide the adult or umbilical cord hematopoeitic cells needed to restore their immune system after receiving the chemotherapy and/or radiation treatment that may cure their disease. The world-wide exchange of adult donor cells and CBUs for transplantation has functioned efficiently and relies on the altruistic donation of these cells from donors who do not know who their recipient is. There are three different types of Cord Blood Storage. 1. 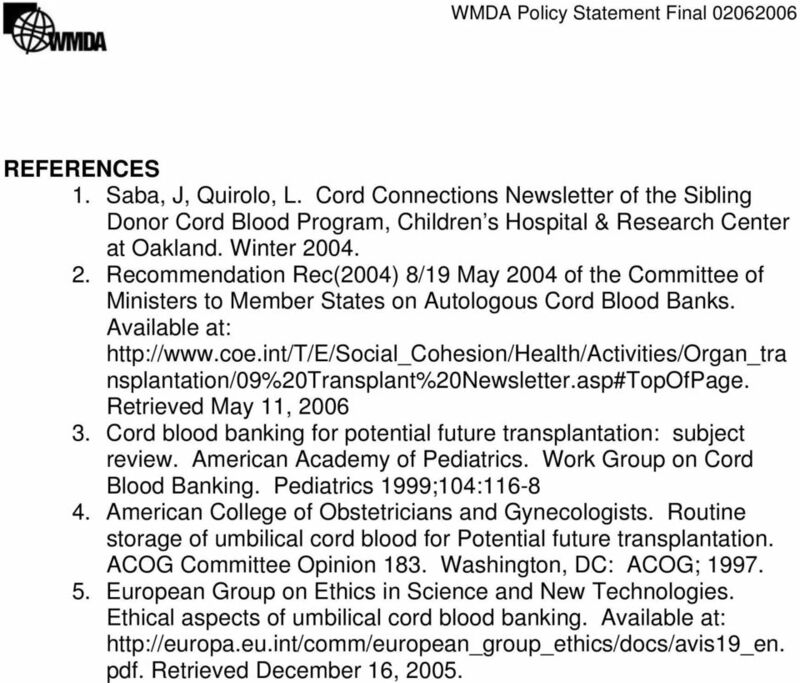 Public Cord Blood Banking 2. Medically Indicated, Directed Family Cord Blood Storage 3. Autologous or Family Storage (Private Cord Blood Banking) Public Cord Blood Banking Cord blood unit donation and storage for public unrelated, allogeneic (cells come from a person other than the patient) use is a newer and growing donation option. Today, there are a number of countries that offer public programs for collection and storage of these cells by cord blood banks. These banks store cells for use by patients who need a transplant from an unrelated donor. Many registry members of the WMDA list these CBUs and make them available for their domestic patients and other patients throughout the world. 7 potential for use of currently accepted medical therapies using CBUs and possible future uses, which have not yet been proven or tested in humans. 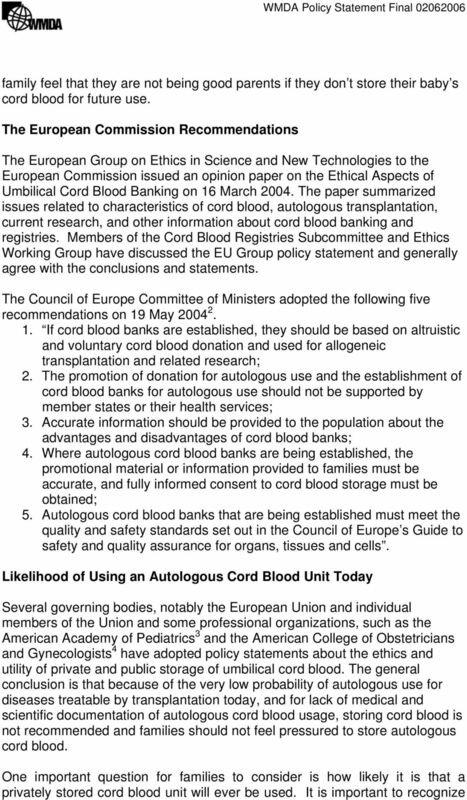 The European Union (EU) Group in its opinion paper published 16 March, 2004 and titled Ethical Aspects of Umbilical Cord Blood Banking 5 based the following statements on such considerations. 1. Research is taking place into differentiation of pluripotent stem cells into specific cell types which could be used for the treatment of chronic diseases such as Parkinson s, diabetes, cancer, or cardiac infarcts by means of human stem cells but no clear proof of utility of stem cells has been shown. The opinion also states that, The possibility of using one s own cord blood stem cells for regenerative medicine is currently purely hypothetical. Research in this field is only at a very early stage. The conclusion of the section on current research is, It is therefore highly hypothetical that cord blood cells kept for autologous use will be of any value in the future. 2. A portion of the opinion that discusses the ethical aspects of cord blood banking states that, The legitimacy of commercial cord blood banks for autologous use should be questioned as they sell a service which has presently no real use regarding therapeutic options. Thus they promise more than they can deliver. 8 REFERENCES 1. Saba, J, Quirolo, L. Cord Connections Newsletter of the Sibling Donor Cord Blood Program, Children s Hospital & Research Center at Oakland. 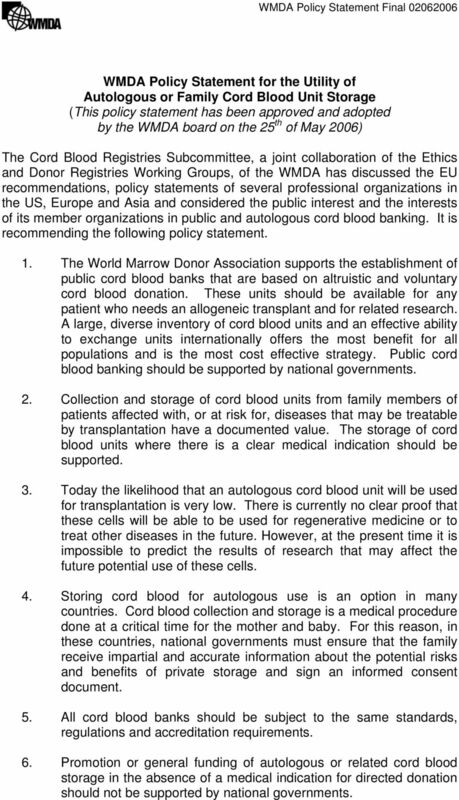 Winter Recommendation Rec(2004) 8/19 May 2004 of the Committee of Ministers to Member States on Autologous Cord Blood Banks. Available at: nsplantation/09%20transplant%20newsletter.asp#topofpage. 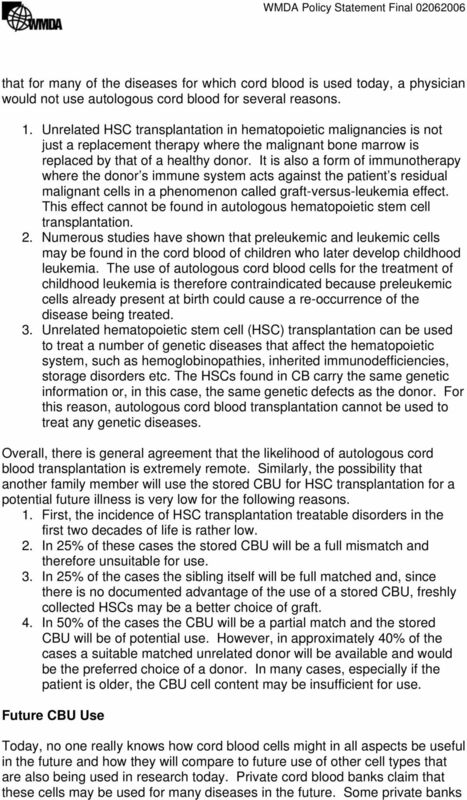 Retrieved May 11, Cord blood banking for potential future transplantation: subject review. American Academy of Pediatrics. Work Group on Cord Blood Banking. Pediatrics 1999;104: American College of Obstetricians and Gynecologists. Routine storage of umbilical cord blood for Potential future transplantation. ACOG Committee Opinion 183. Washington, DC: ACOG; European Group on Ethics in Science and New Technologies. Ethical aspects of umbilical cord blood banking. Available at: pdf. Retrieved December 16, 2005. 4. All cord blood banks should be subject to the same standards, regulations and accreditation requirements. cord blood saves lives... ...by providing a rich source of blood stem cells that can be used to treat over 80 different diseases including leukemia, lymphoma, thalassemia, Tay-Sachs and sickle cell anemia. UMBILICAL CORD BLOOD BANKING A guide for parents 2 nd EDITION INTRODUCTION The cells contained in the umbilical cord blood have therapeutic value for the treatment of blood disorders and immune diseases. SAVE A LIFE... BY GIVING LIFE! UMBILICAL CORD BLOOD BANKING A guide for parents This guide has been elaborated by the Council of Europe European Committee on Organ Transplantation (CD-P-TO). For more information, please visit https://go.edqm.eu/transplantation. CBS National Public Cord Blood Bank. Did you donate your cord blood? Q: Why is there a need for people to join the Be The Match Registry? It s not something you want to think about, but it s something you want to prepare for. Most Patients who Need an Allo Transplant Can Find a Well Matched Donor Important Points: Most patients can find a well matched or a very well matched available adult donor in the Be The Match Registry. APPENDIX A SAMPLE CONSENT FORM CORD BLOOD TRANSPLANTATION (COBLT) STUDY SAMPLE CONSENT FORM FOR THE EXPANDED ACCESS PROTOCOL You (your child) are being asked to take part in a clinical research study. Helping you find the one match.. Guide for Unrelated Stem Cell Transplant Patients OneMatch Stem Cell and Marrow Network BLOOD. 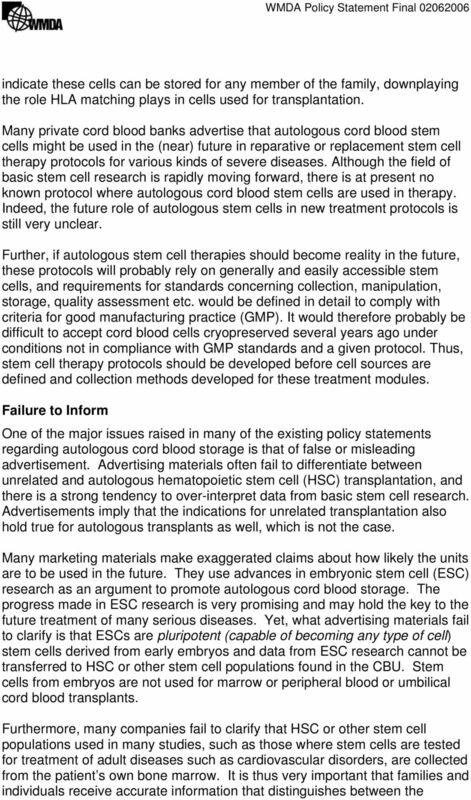 hematopoietic stem cells from cord blood: - costless but too expensive? Dr. Vincent Kindler Geneva Cord Blood Bank HUG vincent.kindler@hcuge. Donation of Umbilical Cord Blood. A precious life offer. for everyone! BCSLS Telehealth Stem Cell Transplantation. Our Story. Diseases treated with stem cell transplants. Why is there a need for stem cells? Statement of Joanne Kurtzberg, M.D. Donate your baby s cord blood and save lives. CORD BLOOD DONATION. is free, painless, and can save lives. Cord blood donation is a painless and free gesture, helping others and saving lives. Saving your baby s s cord blood: Is this good insurance?